I am a huge believer in cookies. Cookies for breakfast (I blame my mother). Cookies for a mid-morning snack. Cookies for a late-night snack. You see where I'm going here, right? I have plenty of tried and true cookie recipes, but I'm always willing to open the recipe book and welcome a new one into the fold. This summer I saw a recipe for "Chocolate Chewies" in the local newspaper that intrigued me. It was from a local baker and the idea behind all of the recipes featured was gourmet cookies at home. It only had 5 ingredients and no flour. I had to try it. Since the recipe calls for egg whites and powdered sugar, the end product had a lightness to it that normal cookies don't seem to have. Just remember one thing when you are working with powdered sugar...it's powdery and can made a real mess if you get a bit crazy with the whisk! The recipe called for toasted nuts - like walnuts - but I didn't have any so I just added extra chocolate chips. I also used Ghiradelli 60 percent Cacao (bittersweet chocolate) chips to punch them up a notch. Totally worth it! This recipe is definitely going into the recipe book. And, Leah, these ARE making an appearance at the office this week! Combine sugar and cocoa, whisking well to combine. Add chocolate and nuts. Add egg whites, and mix until combined. Scoop golf ball-size portions of dough and place on parchment-lined sheet tray. Bake for 25 minutes until the tops begin to show small cracks. Makes 1 dozen cookies (or more if you scoop out ping pong-sized portions). I was REALLY craving some cookies last night. Wish I would have had these handy :) They sound yummy! Thanks for linking up with the Tuesday Train! Have a wonderful week. Cookies for breakfast is never wrong. lol Im your newest follower. 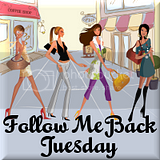 Following you from follow me back Tuesday, I would love a follow back. Wow. Those sound like some good cookies. I think cookies should be eaten for every meal, too! Those make very pretty cookies too! That looks super good... and dangerous. I have all those ingredients in my cabinets!